In the first of three successive fixtures at Celtic Park, Leigh Griffiths' first-half winner in the 1-0 win victory over Hamilton on Tuesday night took the Hoops 11 points clear of Rangers at the top of the table with two games in hand. Brendan Rodgers' side, unbeaten in 19 domestic games this season, host Dundee on Saturday before Partick Thistle visit next Tuesday night. The Denmark defender, while acknowledging that the champions were not at their best against Accies, is hoping to use home advantage to further cement their already-commanding lead. "These games occur in a season where it is always a bit tense and even though we always want to perform our best and play great football, some of these games will happen in the season. "But the boys stood up and won 1-0 and these games are important as well to take with us. "Now we have a few home games and it is going to be nice playing at Celtic Park." Rodgers took the unusual step of starting with both Griffiths and Moussa Dembele and they combined in the 36th minute to break the deadlock. France Under-21 striker Dembele was sent clear of the Hamilton defence by a Tom Rogic pass and unselfishly squared for Griffiths to knock in his 11th goal of the season. 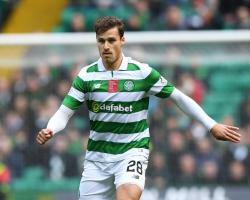 Sviatchenko was impressed by the strike partnership overall. "I think we saw something that is really good." Griffiths, who for so long this season has played second fiddle to Dembele, started his second game in succession after scoring in the 4-1 win at Partick Thistle last Friday. He said: "That's two 90 minutes in a row I've played now and I'm feeling really good. "I just want to keep playing as many minutes as possible, and if I do that then my goal tally will keep going up and the three points will keep coming."